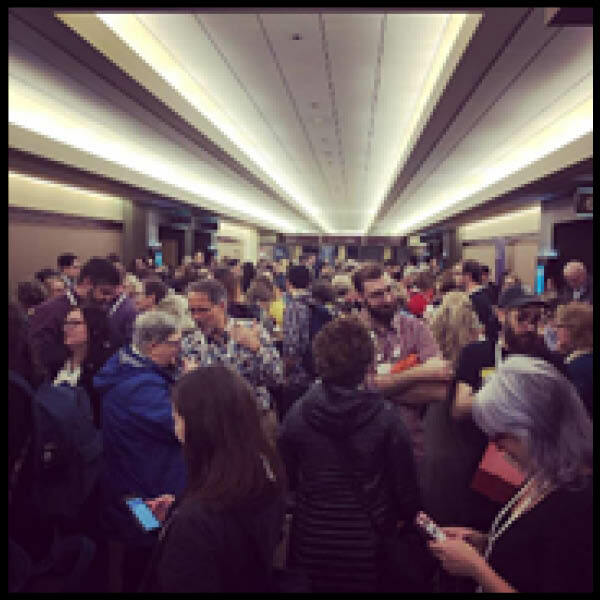 Last month a co-worker and I were lucky enough to attend the American Library Association (ALA) Midwinter Conference in Seattle, Washington. I could go on for pages talking about the amazing things I learned and the awesome people I met, but today I want to focus on my favorite part of the conference, the Youth Media Awards (YMA). 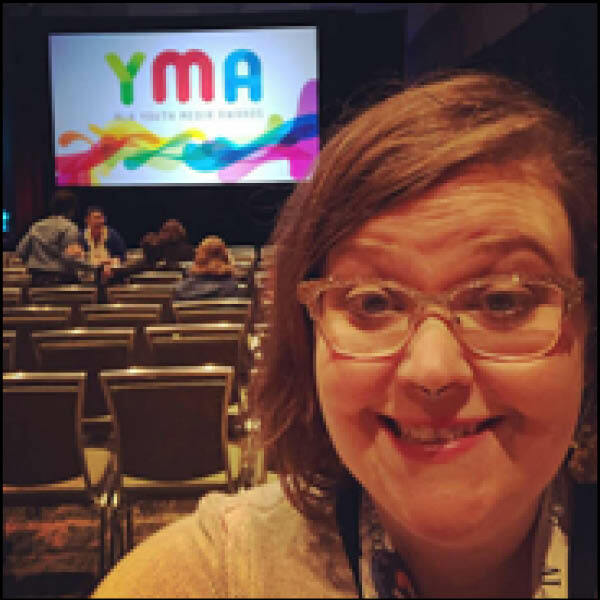 The YMA’s are announced every year at Midwinter and include such categories as the Stonewall Award, the Theodor Seuss Geisel Award, and of course, the more famous Printz, Newberry, and Caldecott awards. Additionally, this year was the 50th anniversary of the Coretta Scott King Award! The crowd at 6:30 a.m.
As someone who works in the youth services department, and is passionate about children’s literature, I wanted to make sure I was front and center in the room when they announced the winners. They were scheduled to start promptly at 8:00 a.m. I assumed a reasonable time to arrive for a good seat was between 5:30 and 6:00 a.m. However, when I arrived I was about 40th in line! Everyone brought food and books, and we sat on the floor talking about books and programs, having a great time. By the time 7 o’clock rolled around, there were hundreds of people behind me! The doors opened at 7:30 and I had an excellent seat. There was a buzz in the room, remarkable for that early on a Monday morning. Everyone was chattering, excited and making predictions. When ALA President Loida Garcia-Febo kicked things off promoptly at 8:00, each award announcement was met with “oohs” and “aahs” and cheers. My seat near the front. As the program progressed from newer to the more longstanding awards, you could almost feel the room vibrating with excitement! When it came time for Dr. Jamie Campbell Naidoo, the president of Association for Library Services to Children, to announce the Caldecott and Newbery awards, the attendees were on the edge of their seats. When he said the committee chose four honor books for the Caldecott award, there was a collective gasp! Finally, Dr. Naidoo announced Merci Suárez Changes Gears by Meg Medina as the winner of this 2019 John Newbery Medal for the most outstanding contribution to children’s literature and the room erupted in claps and cheers. Being in a room filled with hundreds of people who are as excited about children’s literature as I am was the highlight of my time in Seattle. If you would like to watch the recorded live stream of the YMA’s it’s available here. You will find a full list of winners here. Ruby Smart is a Youth Services Assistant at CRCPL and is currently working towards at Masters Degree in Information and Library Science from Clarion University.